Anglers love fishing on Hamlin Lake during the winter. Hamlin Lake is located just four miles north of Ludington in West Michigan. Ice fishing on Hamlin Lake is a great way to enjoy the winter--just set up a shanty and get ready to catch some bluegills, crappies, perch, walleye, pike and muskie. 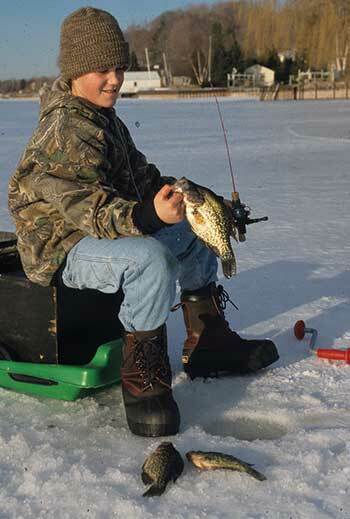 Several ice fishing tournaments are held each winter on Hamlin Lake. The State of Michigan offers its residents and out-of-state visitors two Free Fishing Weekends per year. According to the Michigan Fisheries Department (517) 373-1280, the Free Fishing Weekend February date is always the weekend before President's Day. For both days, all fishing licenses will be waived, but fishing regulations still apply. Enjoy great fishing on inland lakes and all five Great Lakes. Read about more local fishing tournaments throughout the year. At more than 12 miles long and 5,000 acres large, Hamlin Lake touches Manistee National Forest on the north, towering dunes in the west and miles of undeveloped wilderness all around. This man made lake originated during the logging hey-day when lumbermen dammed the Big Sable River to make an enormous holding pond for trees felled upstream. It is a very popular lake, even in the winter, as ice shanties pop up and anglers fish for bluegill, crappie, perch, northern pike, muskie, and walleye.